Reeds Ferry builds and installs every shed we sell. Buying direct from our factory makes a huge difference. The company that builds the sheds at the big box-store pays the store a large percentage of the sale price to stock their shed. The only way that company can turn a profit is to build their shed with less lumber and lower quality materials. By eliminating the “middleman” Reeds Ferry is able to put every dollar into building a better quality shed. We follow the same construction codes required for a house; this means you’ll find more lumber inside a Reeds shed, and only the highest grade lumber; no particle board. Take our shed tour and compare. 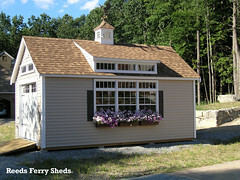 Visit Reeds Ferry’s factory showroom and see five acres of sheds and gazebos on display. We offer hundreds of attractive storage sheds in every size, style, and color. Installed by Reeds Ferry with free delivery throughout New England. When is a Reeds Ferry Shed, not a shed?